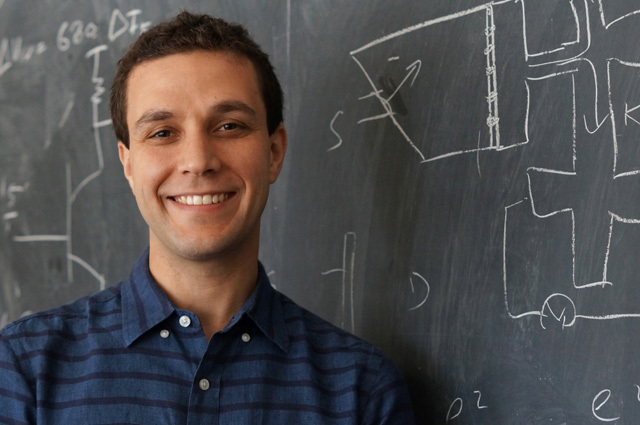 Assistant Professor Andrea Young recently won two prizes recognizing his two-dimensional work with graphene. A young scientist, recently arrived to UCSB from MIT where he was a post-doctoral Pappalardo Fellow, has found himself lauded by the 2016 McMillan Award and a science and engineering fellowship from the David and Lucile Packard Foundation. Andrea Young’s research is on a minute scale. Working on graphene, which he’s described as 30,000 times thinner than Saran Wrap — “it gets wrinkled, and it’s a mess” — Young’s doctoral work at Columbia University to successfully layer these atom’s-width sheets into van der Waals heterostructures earned the notice of the McMillan Award committee, which recognizes scientists doing significant work within five years of earning their PhD. Young has been invited to the University of Illinois at Urbana to deliver the McMillan Award Lecture when he accepts his $3,000 prize and plaque — the prize is given in honor of Bill McMillan, considered “the ablest condensed matter physicist of his generation,” who died in 1984 at the age of 48 when he was struck by a driver while cycling — and the Packard fellowship gives him $875,000 over five years with the freedom to conduct his research as he wishes.